Camie Grillo (Peterson), 77 , passed away at her home in Bothell, Wa., after a long battle with cancer. She was born in Kirkland, Wa. to Harold and Blanche Peterson on April 28, 1941. She grew up on Norway Hill in Bothell, attended Bothell High School graduating in 1959 and went on to get her license in cosmetology. 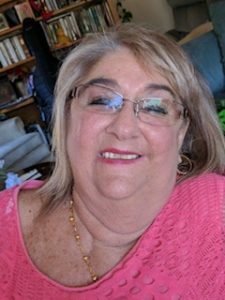 She worked as a cosmetologist making her clients beautiful and happy for 40 + years. In 1961, Camie married Larry Grillo of Goldendale Wa. They had two sons Geoff and Scott. Later she raised another son Brandon Ruiz. She loved her family and friends and really enjoyed traveling to warm places like Cancun, Fiji, Hawaii and Central America. Camie is survived by her 4 siblings Larry (Wan) Peterson, Linda Edwards, Darlene Parker and Cindy (Dennis) Pasek, her 3 sons Geoff (Barb) Grillo, Scott (Kwan) Grillo and Brandon Ruiz, 6 grandchildren and 9 great grandchildren, many neices and nephews along with many cherished friends and family. A celebration of life will be held at 11 am on Saturday April 27th, 2019 at Bothell First Lutheran Church. In lieu of flowers, please consider a contribution to St. Jude Children’s Research Hospital or the Amercan Cancer Society .